Employers looking to quickly get new hires up to speed with construction theory and basic skills, while not losing valuable time on the jobsite. Employers looking to broaden their workforce’s skill set by giving employees cross-training in another trade. Individuals looking to get top training by experienced professionals that will help them be prepared for the 2019 Construction Season. Tuition for this training is just $1,100 for ABC Members and unemployed students, and $1,425 for students from Non-Member companies. Those wishing to continue to take craft training can move to Level 2 in the Fall of 2019 and complete the Core Curriculum at that time. 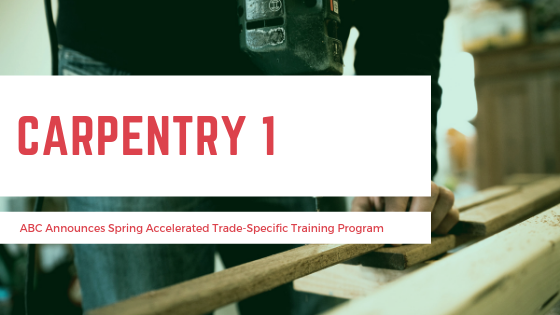 These classes fill up quickly, so don’t miss out on this cost-effective opportunity to jump start your workforce’s skill set, or to get the fundamental skills you need to join the construction industry in 2019. Classes start the week of March 18th.